Welcoming our new residents on their first day at the CFC. 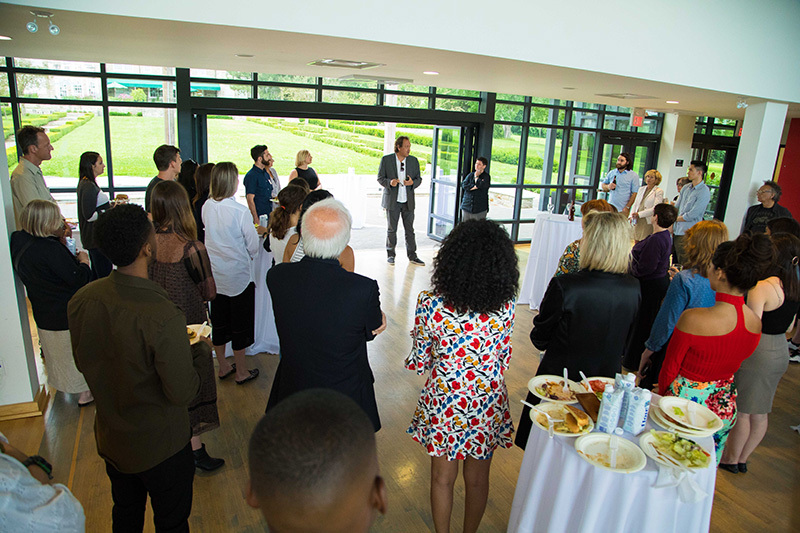 From Victoria to Halifax, Winnipeg to downtown Toronto, 30 talented new creators arrived on the grounds of Windfields Estate this week. They’re starting in this year’s CBC Actors Conservatory, Cineplex Entertainment Film Program and Slaight Music Residency. It’s the first time these three programs’ start dates align – a historic move designed to spark collaborations and creative community. 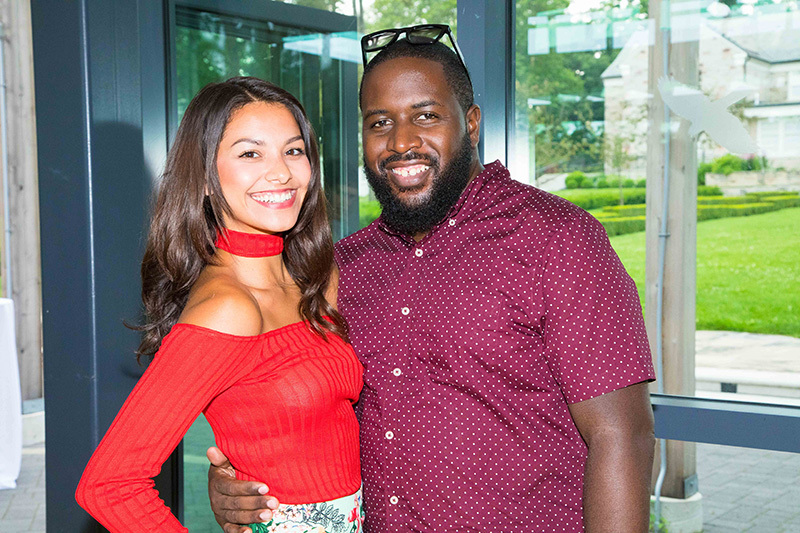 After an intensive first day of workshops, including an ice-breaking improv session designed & delivered by Second City’s Kevin Frank and Lisa Merchant, they relaxed at a BBQ reception with each other and program mentors. We chatted with some of them about what drew them to the CFC and what they planned to do. A common theme? The desire to learn by collaborating and develop compelling stories for the screen. Slaight Music Resident and songwriter-recording artist Sarah Slean summed up a view many expressed: “I am most looking forward to collaboration. In my professional life thus far, I’m building stuff from the ground-up, working with other people, but usually giving them my vision and they’re helping me to build the story and music in my head. I’ve never had a really immersive collaborative experience and I’m super excited about that." CBC Actors Conservatory resident Humberly Gonzalez and Cineplex Entertainment Film Program Directors’ Lab resident Thyrone Tommy. Cineplex Entertainment Film Program residents, director Thyrone Tommy and producer Gharrett Patrick Paon, shared what drew them to the CFC. 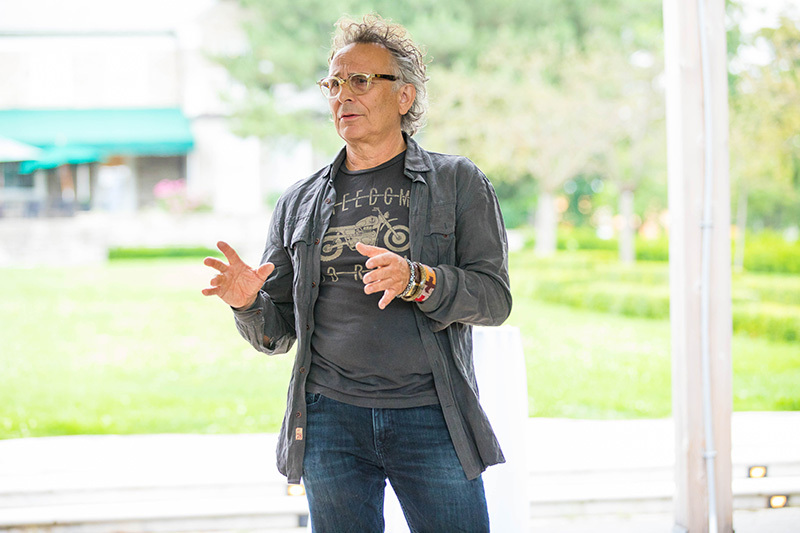 “I’m hoping to work with more actors and musicians, and build upon the skills that I am already bringing into the program,” said Tommy, “to experiment and stretch the bounds of what I can do in film.” Paon, coming from the East Coast, knew “good friends who are successful” and who had come to the CFC. They recommended the program to him, which was, as he put it, a “natural progression to further my career.” While at the CFC, Paon will be collaborating with CFC alumnus Cory Bowles, to develop and package Bowles’ second feature. Michael A. Levine, Foundation Director of The Brian Linehan Charitable Foundation, was on hand for the event. “I’ve had the privilege of serving on the first board of what became the Canadian Film Centre,” he said and added, “Frankly, I’ve been a one-man raving party of this place since the beginning.” Levine then offered the new residents some words of wisdom. “It’s a very enriching life, [but] it ain’t fair. It takes all the qualities that have been described to you plus the ability to cope with your mental state when 98% of the people say ‘No.’ Because if you look carefully enough, two people will say yes. And that will make all the difference." 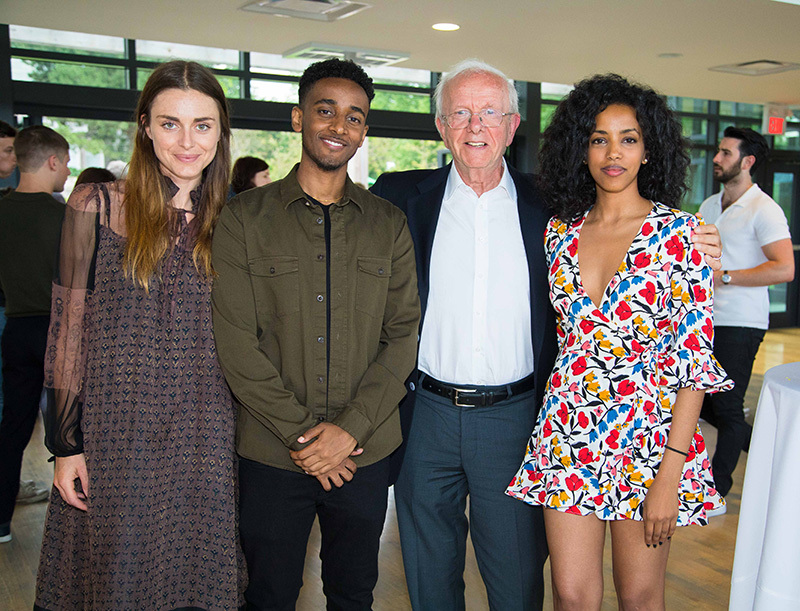 Michael A. Levine with CBC Actors Conservatory residents (L-R) Kaelen Ohm, Nabil Rajo and Getenesh Berhe. CBC Actors Conservatory residents Kaelen Ohm and Humberly Gonzalez echoed similar points of view. “What drew me to the CFC Program,” Ohm noted, “was their connection to the industry as it is presently, the intimate nature of the group, and knowing you’re going to get one-on-one time with everybody and in-depth collaboration with the mentors.” Gonzalez added that as someone who has been acting for a while now, she’d “like to get a different perspective from others on how they start their process,” for “where the idea emerges from and how it comes down to the actor to perform that idea." Cineplex Entertainment Film Program residents, writer Marni Van Dyk and editor Shaun Rykiss, also stressed the value of working together. “I am a writer and that’s often a very solitary profession,” Van Dyk said. “I love to collaborate, so there’s an incredible opportunity for cross-pollination across disciplines, to develop a piece, have the structure and the resources to make it the best it can be, and collaborate with people I wouldn’t have had the opportunity to otherwise." “Honestly, the thing I am most excited about is collaborating with other professional filmmakers from across the country,” Rykiss said. “You can get locked into your own communities oftentimes, so it’s good to expand out, learn from those people’s experiences and expand more as a filmmaker in general – and hopefully make some really great content!" Once everyone had their burgers and veggie burgers in hand, CFC CEO Slawko Klymkiw formally welcomed them and stressed that the relationships residents build for their futures at the CFC are what’s “key to this place.” He added that we all hope to “incite the very best from you, because inevitably, you give back to all of us." Marc Jordan, Slaight Family Music Lab Songwriter Chair. One look at this group of talented individuals and it’s clear: they’ll generate even more impressive creative work by working together. Congratulations to all of our new residents. We hope your time at the CFC is truly exciting and collaborative. All photos by Mark Binks Photography.